A glimmer of hope for wilderness! Sen. Michael Bennet (D-CO) introduced the San Juan Mountains Wilderness Act, which would protect nearly 61,000 acres in southwest Colorado. Our Colorado Broads, especially the Northern San Juan and Grand Junction Broadbands, were strong voices in the collaborative effort and are thrilled with the prospect of earning protection for these iconic wild lands. 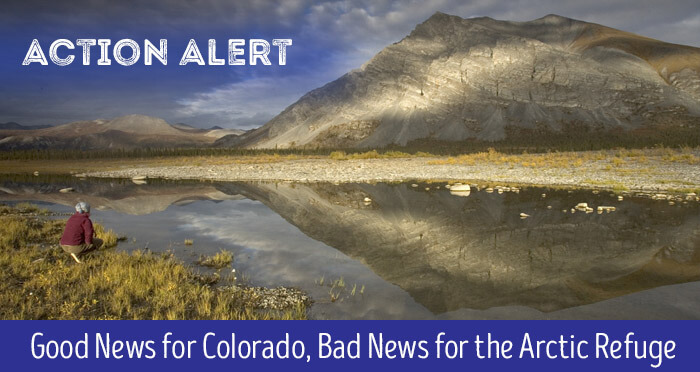 Please thank Senator Bennet and ask your senators to co-sponsor this bill. 1. Rep. Scott Tipton (D-CO, District 3) and other Colorado representatives to ask for the bill to be introduced. 2. Contact other state House representatives to ask for their support of this legislation. The first step toward desecrating the Arctic National Wildlife Refuge (ANWR) kicked off on April 20 with the Bureau of Land Management opening the scoping process to evaluate the environmental impacts of oil and gas drilling. After a decade of staving off energy development from “America’s largest and wildest piece of publicly owned land,” the Trump Admin and energy industry cronies are pushing this forward despite a Yale survey that found 70% of American voters oppose drilling in the ANWR.